https://sep.yimg.com/ay/yhst-33477391359232/fathead-anthias-serranocirrhitus-latus-sunburst-anthias-8.jpgFathead Anthias - Serranocirrhitus latus - Sunburst Anthias Expert Only!!! Not Cover Under Arrive GuaranteedPeaceful30 Gallon5.1 inchesYesCarnivore, Feeder Shrimp, PelletIndonesiaSerranidaeSmall 0.5" - 0.75"
Unfortunately Our Stay Arrive Guaranteed Does not cover this particular species. It is a very delicate shipper!! The Fathead or Sunburst Anthiaslives either solitarily or in a small haremic group, mainly under overhangs or in caves. Another plus relative to its close relations is this species aquarium hardiness. Given some easy provisions, this can be a gorgeous addition to most any peaceful reef system. The placement of this species with the Hawkfishes centered on its morphology (structure), very much more like the cirrhitids than Anthiines externally, with a high and deep head and long pectoral fins. The species observed behavior would have likewise not placed it with the Fancy Basses... more sedentary, non-schooling. For Fathead Anthias fish, should still be sizeable to accommodate plenty of cover, caves for their selection, especially should one be getting more than one male. A hundred gallons is about right, with lots of live rock, and preferably subdued lighting, or at least a shadier region out of the typical "noon sun in the tropics" conditions most hobbyists supply. Remember, Fathead Anthias are collected in scuba depth waters, in cave-like settings. If keeping more than one Fathead, it is ideal to have a mated pair. A male often exhibits territorial behavior when housed with other males. Maximum Size: The Fathead Anthias grows up to 4 inches. General Size Specifications: Males to about five inches overall, females to three in the wild. More like half these dimensions in captivity. Water Conditions: Needs to be high and consistent. Live rock, macro-algae and if you can an accessory sump/refugium with ongoing crustacean co-culture will keep your zooplanktivorous livestock in good health and activity. Habitat: Fathead Anthias are found near Western Pacific; southern Japan, Taiwan, south to New Caledonia, the Great Barrier Reef/Australia, over to Fiji and Micronesia (Palau). Typically in fifty plus foot depths near coral reefs under rocks, in caves. Feeding and Diet: The Fatheads eating habits have been mentioned. They consume crustaceans, worms, larval fishes by "wait and attack" methods. A refugium, live rock, that will supply "surprise" feedings is of distinct advantage in their nutritional upkeep. Barring this, frequent small feedings of small or finely divided meaty food items (a few times per day) will keep your Sunburst Anthias full and alert. Diseases, Prevention/Treatment Like most Anthias, Fathead are either healthy or surely gone to all the way gone by the time you "catch" them succumbing to the usual reef fish diseases. Do use a small flashlight to examine Fathead daily. Infectious and parasitic disease are of course best warded off by prevention: good maintenance procedures, regular testing, and nutritional "boosting" with a vitamin and iodide solution added to their food and water about once a week. As you might assume, for such small fishes, this species is sensitive to copper and harsh dye/medicine concentrations. Take care to keep levels of these at "just therapeutic" should you find yourself using them with this fish. 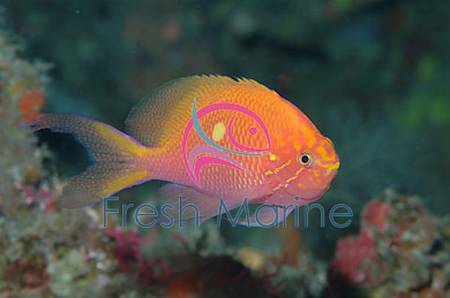 Breeding: Fathead Anthias species all share the trait of being hermaphroditic. If a dominant male perishes, the largest female of the group will often morph to take its place.